This fiery, full-flavoured Singapore-style dish is a quick and easy substitute for a Friday night takeaway. Heat the oil in a wok over a high heat until smoking. Add the ginger, garlic and chillies and stir-fry for 1-2 minutes. Add the chopped green parts of the spring onions and stir-fry for another 1-2 minutes. Add the tomato ketchup, sweet chilli, hoisin, fish and soy sauces and bring the mixture to the boil. Reduce the heat until the mixture is simmering and simmer for 4-5 minutes. Season, to taste, with the caster sugar, if necessary. Meanwhile, cook the noodles according to the packet instructions, then drain well. Remove 3 ladlefuls of the sauce from the wok and set aside. Add the crabmeat to the wok containing the simmering sauce and stir to coat thoroughly, then continue to simmer for 4-5 minutes, or until warmed through. Divide the crab and the sauce among the serving bowls. Return the reserved sauce to the wok, stir in the drained noodles, the white parts of the spring onions, and all of the mint and coriander, then cook until warmed through. 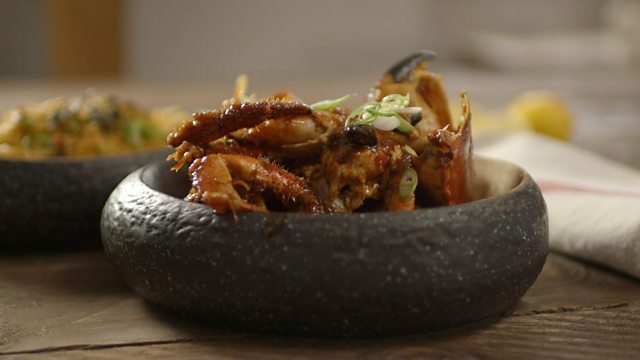 Serve the noodles in bowls alongside the crab.